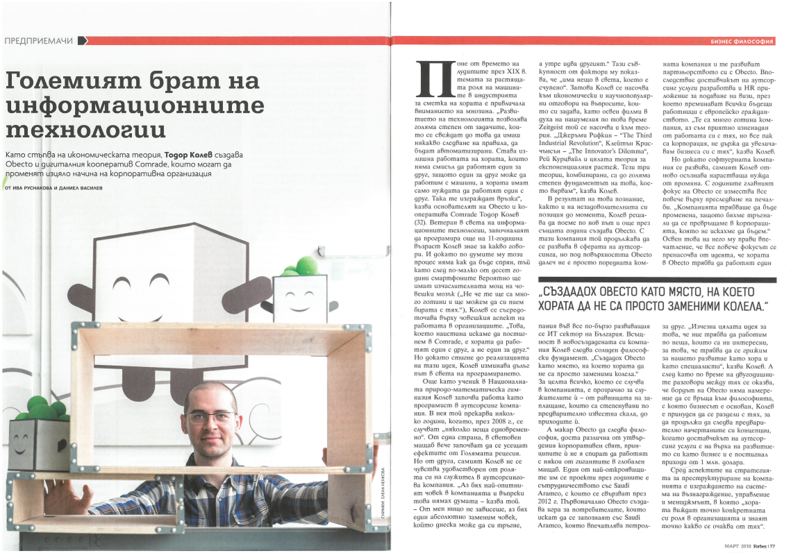 This month Forbes magazine published an article on the founder of Obecto, Todor Kolev. It is a great piece following how Obecto was born, how it evolved over the years arriving at the digital cooperative it is today. Why it changed its business model and how it ultimately led Todor to the idea of building a decentralized autonomous organization on top of the blockchain – the Comrade Cooperative. And while we wait for the digital version of the magazine to arrive we took the liberty to translate the article and share it with you on our blog. Implementing economic theory, Todor Kolev, founded Obecto and the digital cooperative Comrade, which can change the structure of the corporate organizations as a whole. Dating as far back as the Luddites, during the XIX century, the subject of how industrial machines replace people drew the attention of many. “The advancements in technologies allows for a great number of tasks, based on a set of rules to be automated. Thus working for another person becomes obsolete since this work can now be done by a machine. What is left is peoples’ need to work With each other. This way they begin to build a relationship”, says the founder of Obecto and the Comrade Cooperative, Todor Kolev (32y). But he had to come a long way in the world of software development before he managed to realize this idea. While studying in the National High School of Mathematics and Natural Sciences, Kolev starts working as a developer in an outsourcing company. He spends several years there, until 2008 “when several things coincided.” On one hand, the effects of the global economic recession were starting to affect us. And on the other, Kolev himself was not feeling satisfaction as an employee working for an outsourcing company. “I was the most senior developer and still my opinion did not matter – says Todor. My presence was irrelevant, I was an absolutely replaceable person who could leave and someone else would take my place the next day.” Influenced by these events he realized that “there is something broken in the world”. That is why Kolev started to look for answers to his questions in the economic and scientific theories. Starting with the popular in those days movie Zeitgeist and continuing with the theories. “Jeremy Rifkin – “The Third Industrial Revolution”, Clayton Christensen – “The Innovator’s Dilemma”, Ray Kurzweil and the whole theory of economic growth. These three theories combined are to a large degree what I believe in.”, says Kolev. As a result of this new knowledge and the dissatisfaction with his job, Kolev decides to take on a new path. In the same year, he founded Obecto. With this company, he continued his professional and personal development in the world of outsourcing. But under the hood, Obecto is far from just another company in the rapidly growing Bulgarian IT sector. Actually, in his new company Kolev adheres to a solid philosophical principle. “I founded Obecto as a place where people will not be a replaceable cog in a wheel”. That is why everything in the company is transparent for its employees – from the salary levels, determined by an objective scale to the company’s profits. And even though Obecto’s philosophy is drastically different from the established corporate principles, this does not stop it from working with some of the global corporate giants. Among Obecto’s most notable projects over the years is its collaboration with Saudi Aramco who contacted them back in 2012. At first, Obecto develops a game for users who want to get to know Saudi Aramco better. The game impresses the petrol company and they move their partnership with Obecto further. As a result, the outsourcing provider Obecto develops for Saudi Aramco an HR platform which services all future visa applications for their employees with European citizenship. “They are a very cool company. I am very pleasantly surprised with our work with them. Still, they are a corporation with which I do not necessarily want to grow our business volume”, says Kolev. But while the software company continues to grow, Kolev again realizes that an ever-growing need for change is coming their way. During its existence, Obecto’s focus has slowly shifted to chasing profits. “The company had to be transformed because we were slowly becoming the corporation we set out not be.” He notices that the emphasis of the daily operations was now moving towards working for one another. “The whole vision of us working on projects that inspire us, that we need to take care of our personal and professional growth was starting to disappear”, says Kolev. Two years of discussions with the board of directors showed that Obecto does not intend to go back to its root philosophy and Kolev is forced to part ways with them in order to pursue again his initial vision. Just when the outsourcing company is at its financial highest performance, with a sales turnover of 1 mln USD. Among the strategic goals for restructuring, the company is developing a management and reward system, in which “each person sees his specific role within the whole and knows what is expected of them”. The structure of Obecto has changed accordingly. “What we did is we gave autonomy to all teams within the company, while Obecto which served as a brand, began to operate more like a shared infrastructure for the developers”, says Kolev. The lack of traditional board member structure allowed the company to make even bolder experiments. Among which was the new way Obecto began to provide services to its clients. “We began to offer our clients leasing deals for their software – says Kolev. – Our clients pay for it in a way similar to a mortgage. When they form a profit a part of it goes to paying part of the software developed. That is also when Obecto makes a profit.” These additional leasing payments are then distributed proportionally among the developers who worked on the specific project, based on their level of expertise and man-hours spent developing it. That is exactly why the teams within Obecto choose carefully with whom to collaborate. As it turns out there is still a lot of demand for their services even with their new business model. “From our website, we receive one-two project inquiries a week – says Kolev. – Still, last year we began working on only two projects. Meaning we turn down most of those inquiries.” Not long ago Obecto has launched its first large collaboration project: the German startup 4hundred. It allows its users to receive their electricity from renewable energy sources. 4hundred pays parts of their software development with the aforementioned leasing payments: based on the money received from their users. Besides restructuring Obecto, two years ago Todor Kolev decides to bring the organizations he is part of as close as possible to his philosophical ideology of a transparent and flat structure, where one person equals one vote. That is how the Comrade Cooperative is born. An upgrade over Obecto. “Comrade’s mission is to be an autonomous digital cooperative, or as we call it – decentralized autonomous organization”, says Kolev. Unlike in Obecto, which serves as a common platform, Comrade develops several projects innovative in both scientific and technological aspects. They bring together advancements in the blockchain technology, smart contracts, and artificial intelligence. Another venture in which the 16 members of the Comrade Cooperative will focus is the Scynet project. It will serve as a framework for training artificial intelligence agents for various platforms. “The main idea is that these autonomous agents can be trained for any action based on a set of rules, which can give feed information back to the agent on how well it is performing – says Kolev. The first agent we are training and optimizing is for trading.” And as of next year, the coop members will focus on solving two even more important problems. They plan to build a platform called STAMAT (from Software Team Automat), which will match teams of developers to potential clients in need of software development. The second project NORMA, will be a platform enabling STEM education in science, engineering, and mathematics. “If there are enough wonderful, open-minded people who want to collaborate in this new way and possess the right skills – then great. STAMAT will bring them together, WeTonomy will give them a trustless way to collaborate. As for where these people come from – this is NORMA”, says Kolev. The vision fueling Kolev and the other cooperative members is to build a meritocratic structure. “It will not be completely devoid of hierarchical levels, it is just that the means of going up the hierarchy are not functions of capital and power, nor inherited positions, charm or politics. Rather it is a function of having the right technical skills and their recognition by your peers, who also deserved their roles”, says Kolev. So going up the five levels of professional development within the cooperative is based on the real-life achievements and experience of the member. Some of Todor Kolev’s ideas seem to contradict capitalism, but they have the potential to not just democratize business, but through Comrade’s platforms to also allow a large number of people to unite for a common cause, project or value on a global scale. After restructuring Obecto two years ago, with some of the employees leaving the company and the profits going down twofold, this year they are finally getting back to the same level, expected in 2018 to reach around 800 000 USD. You can find more information about the Comrade Cooperative here: www.comradecoop.com.